Under the direction of Wild Mountain management, the Wild Mountain Ski Patrol (WMSP) is trained by and is a member of the National Ski Patrol System. NSP has over 27,000 members nationwide volunteering to provide first aid and transfer to injured skiers and snowboarders. As members of NSP, Wild Mountain patrollers are fully trained in advanced first aid and rescue skills. These skills are refreshed and refined on an annual basis. Over 100 patrollers volunteer to assist in patrolling the slopes of Wild Mountain Ski Area. The National Ski Patrol has provided volunteer rescue and first aid services to ski areas throughout North America for over 75 years. The white cross on our jackets is a universal sign in the snow sports industry for quality service to skiers/boarders in need. 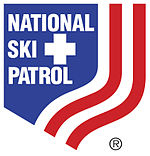 The National Ski Patrol (NSP) is the patrol governing body for the United States and some portions of Canada and Europe. The organization was founded in 1938 by the NSP's first chairman, Charles Minot Dole. "Minnie," as he was known, decided that a "service and safety" organization was in order after he hurt himself skiing at Stowe, VT and had trouble evacuating himself from the slope. He created the Mount Mansfield Ski Patrol for the National Downhill and Slalom Championship at Mt. Mansfield. Roger F. Langley the president of the National Ski Association asked Dole to consider a national patrol. Dole later went on to create the 10th Mountain Division after seeing Finnish soldiers on skis destroy two armored divisions. One of the few federally chartered not-for-profit organizations in the U.S., the NSP has since become the world's largest winter rescue organization. The NSP's 26,500 paid and volunteer members serve on over 600 patrols. The NSP is composed of 10 geographic divisions plus a single division for all paid patrollers. Members are recognized on the slopes by the red jackets they wear marked by a white cross on the chest and a larger one on the back, or by the older style of blue and rust-colored parkas with yellow crosses. Merits, Awards, and Ranking; The levels of the National Ski Patrol are 1.Patroller 2.Alpine Patroller 3.Senior 4.Certified. There are also levels of personal achievement given to a Ski Patroller who goes beyond the call of duty is awarded the Yellow Merit Star. The highest Honor of the National Ski Patrol is the Purple merit star, this is awarded for saving a life. National Ski Patrol has an ongoing education system which includes OEC refreshers, Ski Lift evacs and OEC classes, and has grown into an authority on outdoor emergency care. In most cases, an Outdoor Emergency Tech (OEC) is equivalent to EMT status. Over the course of its history, the NSP has helped to develop similar patrol organizations in Canada, New Zealand, Australia, Argentina, Chile, Israel, Turkey, and Korea.